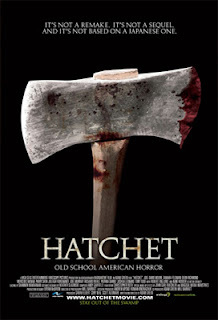 I’ve been waiting a long time for this one - Anchor Bay Entertainment’s “Hatchet” opens in limited release, only 78 screens. Kane Hodder plays the title role of Victor Crowley and it’s also got Robert Englund and Tony Todd. It’s a so called return to ‘old school American horror’ and I can’t wait… All the reviews are good, should be a classic. “Once there was a boy named Victor Crowley. He was born hideously deformed, and sadly, folks weren’t too kind to him. So he spent most of his life hidden in his Daddy’s house out in the bayou.One Halloween night, the local children came throwing firecrackers at the house to tease and scare him. And the old Crowley house caught fire. When Victor’s Daddy arrived home, the house was in flames. He went to the barn, grabbed himself a hatchet, and started chopping down the front door. But what he didn’t know was that Victor was pressed up against the other side, trying to get out. He hit him square in the face with that hatchet… and poor Victor Crowley died. The old man went into mourning and became a recluse after that. Never left the house. Never spoke to anyone. He finally passed away about ten years later. And that’s when the stories started. They say people tend to disappear in that swamp. And if you get close enough to the old Crowley house at night you can still hear Victor Crowley. Still roaming in the woods. Also opening in extremely limited release is After Dark Films “Fierce People”, which I can’t find any information about. The two big movies opening tomorrow are Lionsgate’s “3:10 to Yuma” and New Line’s “Shoot ‘Em Up”.